Michael, a Mayo paramedic, wanted to make a change for himself, his family and his future. When applying for a specialty team for his job, he found himself needing to get more fit in order to be competitive with his colleagues and to have a chance to become a flight paramedic. After being turned down in his first interview, Michael lost some weight and was offered the job on his second interview. 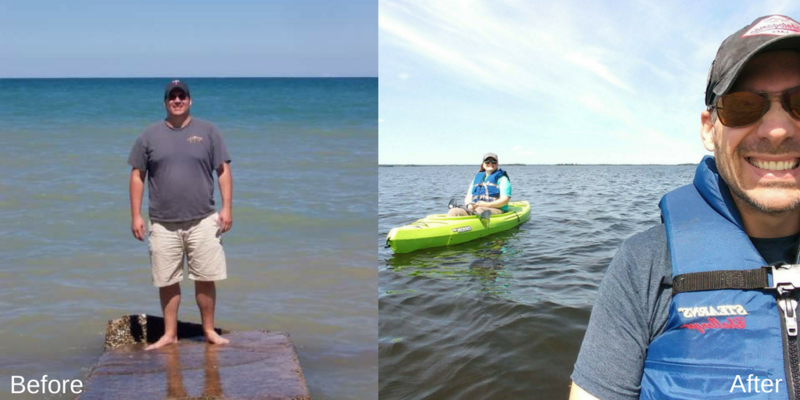 The job positions were his initial motivations for losing weight, but as he continued getting fitter, he realized he wanted it for himself. Consequently, Michael’s girlfriend at the time (now his wife) challenged him to do a triathlon, which he successfully completed in 2016 and 2017. Barriers to his goals included his work schedule as he works straight nights. He also had to work on his eating and drinking habits by incorporating a lot more moderation and balance surrounding his diet. Michael also credits his wife as being his main cheerleader for staying fit and supporting him on the sidelines at his many races. Additionally, Michael shared that what kept him motivated throughout his health journey was how good and confident he felt as he progressed. He says he performs better for his colleagues, his family and his patients. Thank you, Michael, for sharing your inspiring story! If you are looking to get started on your journey but aren’t sure where to start, sign up for your free wellness consultation at the front desk. Click here for more inspiring member stories.